Rediff.com » Business » New Porsche 911 GT2 at Rs 1.5 crore! 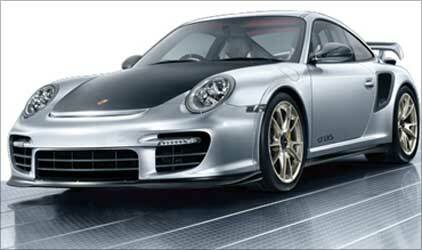 New Porsche 911 GT2 at Rs 1.5 crore! Indian auto market is not only attracting economy models or luxury car makers, the country has also become a launch pad for ultra-luxury and super cars. As the US economy struggles to grow and Europe faces another economic crisis carmakers across segments are bound to enter the emerging markets. India features among the favourites and India'ss lucrative position has drawn the attention of US President Barack Obama, who thinks that Indians are buying a lot many more cars than they used to. Thus it is not surprising at all that the all powerful and super fast Porsche 911 GT2 RS made it to the Indian market. This 3600cc twin variable turbo powered, 620 bhp beauty can be yours for Rs 1.5 crore (Rs 15 million). The car will take you from inertia to 100 kmph in just 3.5 seconds and 200 kmph speed in 9.8 seconds. This is not all; the car has a top speed of 330 kmph. So, move over Porsche 911 GT2 and Porsche Carrera GT. This all new Porsche would be imported into the country and is likely to be available to Indian customers against confirmed bookings. Porsche is a much coveted brand in the country and is loved in the country just as it is loved abroad.